Thirsty Girl team, with whom I collaborated with the Ghirardelli Intense Dark event last year, wanted to send me some Chateau Ste. Michelle Rieslings to try. Coincidentally, just a week before that, a box of Ghirardelli Gourmet Milk chocolate arrived. To top it off, the deadline for a Fresh&Easy recipe contest was fast approaching so I need to make my 7 Layer Dip soon...and I need some help eating it. What's a girl to do with all these goodness happening all at once? She called her friends and planned a dinner, of course! The three Chateau Ste. Michelle Rieslings were 2001 Dry Riesling, 2010 Eroica, and 2011 Harvest Select Sweet Riesling. All are recommended to pair with Asian dishes, Indian curries, crab, scallops, and mild cheese. I just hoped that they would all go well with the 7 Layer Dip. Since I have folks who are allergic to dairy and seafood, the dinner choice went to Aarti's "Tandoori" chicken recipe I saw on Best Thing I Ever Made. The recipe has a lot of components and takes some time to prep but it is easily adaptable to feed my 10 guests. (Will blog about that later). Well, except for the fact that I forgot that the bulk chicken I bought are bone-in and her recipe used boneless. Let's just say that I had to recommend that my guests eat a lot of dip and put more rice and veggies on their plates. Thanks to Paulette, the only person with the frame of mind to snap a photo. First wine we tasted was the 2001 Dry Riesling which I served while folks were still noshing on the 7 Layer Dip, giving me a bit more time to line up the buffet in the kitchen. The tasting note from winemaker Bob Bertheau calls the wine “a dry, crisp, refreshing style of Riesling with beautiful fruit flavors, crisp acidity and an elegant finish. It exudes beautiful white peach and floral aromas with a clean finish.” The wine was a little underwhelming against the strong flavors of the 7 Layer Dip, but it was a nice, neutral wine to sip with tandoori chicken. Aurora took a sip. "Wow. This wine reminds me of Indian food." "Honey, you're smelling the tandoori chicken from the kitchen," quipped Heather. Lee said the Dry Riesling tasted like grape juice and lemonade. She doesn't usually like dry wine but this is fruity enough for her. Brandon on the other hand didn't care much for the dryness while some of us who prefer red actually appreciate the crispness and acidity. Paulette immediately called out the fruitiness of the aroma. Upon tasting, she thought that this would be a great base for a white sangria. Heather agreed. Once everyone had their plates, I poured the 2010 Eroica, named for Beethoven’s Third Symphony. (Naturally, "The Erotica" was what the gang came to call it for the rest of the evening.) Tasting note says, "The 2010 Eroica Riesling exudes mandarin orange and sweet lime aromas and flavors with subtle mineral notes." "How do we like it, folks?" Talk about a perfect pairing! The wine's hint of lime and subtle sweetness was a perfect match for our tandoori chicken with lime and honey in the sauce along with other Indian spices. Lee didn't like the wine by itself as it was too sweet for her taste, but she did like it paired with the food. On that sweet note, Greg compared the wine to a wine cooler--that it's easy to drink and refreshing. Heather liked that "nice, wet finish." David just called it juicy. I saved the 2011 Harvest Select Sweet Riesling for last as I wasn't sure if the sweetness would interfere with food. It wasn't meant to be a dessert wine and I didn't serve it as such. It was the "Drink this while I clear the table and fetch your dessert" wine. At this point, I should probably mentioned that in addition to these great Chateau Ste. Michelle wines, we also drank a bottle each of Firefly Ridge Chardonnay and the effervescent New Age, served with a slice of lime. Oh, and also most of the dinner party were around the TV with Lee as she watched Blade Trinity for the very first time. Hey, no girls should ever go through life without having seen Ryan Reynold's glorious abs…and a vampire Pomeranian! So, between being nicely sauced and the movie in the background, the colorful reviews I elicited earlier was no longer. While the tasting note suggests that the wine "offers beautiful crisp Washington Riesling character with rich flavors of ripe pears and peaches," all I got from the crew was "Yeah this is tasty!" and a moan of approval ("Wow…yummyyy…") from Aurora who sipped hers while nibbling on a chocolate chip cookie. Since nobody threw the wine in my face for interrupting the movie/dessert, I would say that the Sweet Riesling was also a hit. The star of the evening though was Eroica. Now, onto the chocolates. 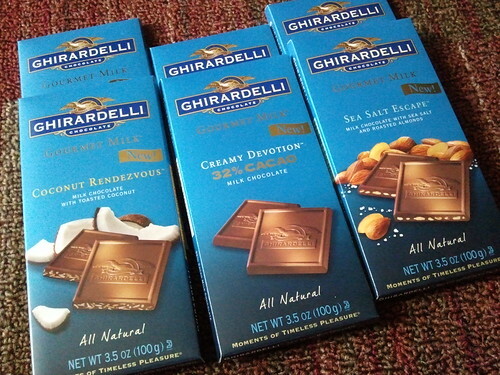 I found Ghirardelli Gourmet Milk chocolates to be incredibly creamy and flavorful. Milk chocolate tends to be overly sweet sometimes but these weren't. Not even Creamy Devotion aka the plain one. These are so good I would ditch the beloved Intense Dark for especially the Sea Salt Escape. The surprise winner of the evening was the Coconut Rendezvous. Heather said that it tasted like Hawaii. Olaina and Paulette who are already fans of the chocolate and coconut combination absolutely love it and were debating as to who get to take the leftover home. Even Lee and I, who absolutely abhor this combination, had to agree that it was probably the least offensive coconut chocolate we ever had. A few pours of tawny port, a few more sips of homemade Limoncello and vanilla-brown butter infused rum, and a whole bunch of dead vampires later, the party rolled out. After all, this was a Wednesday night. The next Feast of Freebies will be for the Villa Maria wines from New Zealand. We'll be doing it on the weekend this time. Mmmm, reliving this dinner. So tasty! I had a great time! It's always nice to spend time with friends and try new things. I love experiencing wine with this group - no holds barred and no snooty wine jargon!